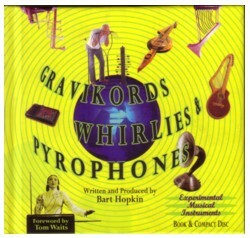 While writing yesterday’s story about Oddmusic.com, I wondered why I could nowehere on the site find any information on the two wonderful books-with-CD’s that Bart Hopkins made for Ellipsis Arts in 1998, called Gravikords, Whirlies & Pyrophones and Orbitones, Spoonharps & Bellowphones . I just found out that the record label Ellipsis Arts no longer exists; it has merged with The Relaxation Company, but the search engine on their website didn’t know anything of the two books-with-CD’s. Very strange, because it are such a great projects! 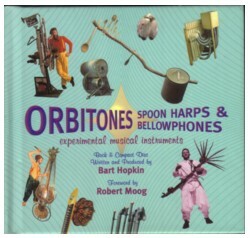 Both books/CD’s feature a collection of unique, unusual or strange instruments. The writer and producer is Bart Hopkins, who in the nineties also made a magazine called Experimental Musical Instruments. His website is still alive, but the two books/CD’s are better. Each book has about hundred pages with information and pictures of the instruments and their makers, who can be heard on the accompanying CD’s. Although the instruments are often weird, this is serious music. Because most of the instruments cannot be described in a few words and without letting them be heard, I just picked out one of my favourites: the daxophone, created by Hans Reichel. 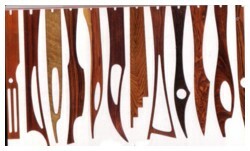 The daxophone is a piece of wood, that can be played as a percussion instrument or with a bow. In the latter case it sounds as an eerie, voicelike electronic instrument. It sounds like this, which is an excerpt of Hans Reichel’s composition Le bal . When I bought these CD’s, I was extremely enthusiast about them and gave them as birthday presents to many of my friends . But to my surprise they were hard to find, especially in record stores. Later I found out, from the men from who I ordered my copies, that very little of these books/CD’s were sold and that the change that there may ever be a third volume released is close to zero. Hard to accept, when I think of all the crap stuff that sells millions of copies. This short story doesn’t do justice to these two beautiful books/CD’s, but I will try to write more about it one other day. Please remind me if I forget it.